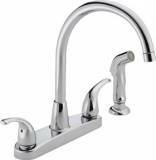 I am well aware that one handle kitchen faucets are very popular these days, but my website is about giving you a choice rather than trying to steer you in a direction you perhaps might not want to go. 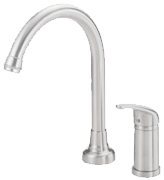 For that reason I’ve included a variety of two handle kitchen faucet designs for you. There are benefits to this style, one being that you can control both temperature and water flow independently of each other. The second reason is they can still add a sense of style to your kitchen, whether it is a modern or traditional look you want. Feel free to take a look below you never know, you might just find what you’re looking for!